UFO SIGHTINGS DAILY: Zanesvilles UFO Sighting Details Found, Nov 13, 1967, UFO Sighting News. 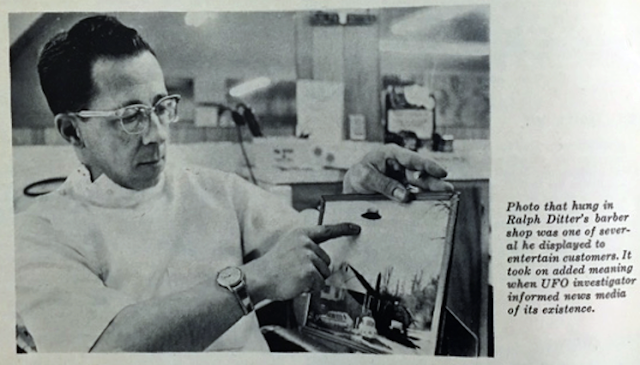 Zanesvilles UFO Sighting Details Found, Nov 13, 1967, UFO Sighting News. Now guys, I got this article directly from an old UFO magazine from Ebay. There are a lot of UFO sightings in these old UFO magazines that have been going untapped for decades. I implore anyone who has a UFO site out there to please purchase some of these old magazines (the older, the better) and put these lost sightings on the Internet for the world. Click here to see these old UFO magazines on Ebay. For instance, the article below does not exist on the Internet, but 10% of it does and some photos do, but a personal interview and description from that day are missing, here the magazine fills in 900% more detail that we had yesterday. That is important! I have found astronaut UFO sightings that have never hit the net before and I will put up soon. We must learn from the past to understand the present. It will solve a lot of mysteries. For three months this photograph of something hung on the wall of Ralph Ditter's barbershop in Zanesville, Ohio. The 40-year-old barber had taken the picture with a Polaroid camera on November 13 when the metallic object moving slowly through the sky caught his attention on a summer day, while he was on his way to his cousins home to photograph some furniture. The object which he described as noiseless and about 20 feet in diameter hovered about 47 feet above the ground rotating counterclockwise on a vertical access. He took three photos. After about a minute and a half that object drifted lazily toward the west and disappeared over the brow of the hill. But Ditter thinking it might return, rushed inside for his motion picture equipment and waited for almost 2 hours for a reappearance. There was none. And amateur astronomer, Ditter, convinced he had seen something from a solar system other than his own placed the photo on the wall of his shop along with a photo of the moon he had taken through a telescope and a chart of the solar system. The display attracted much comments and dinner had no intention of exhibiting it for more than a conversation piece among his customers. He was well aware of the unpleasant publicity that frequently attaches to sighters of UFOs, and he also did not want his place over run with the curious. But word of the unusual photo reached Dr. Benjamin Gilliotte Zanesville physician, former Air Corps officer and a member of the NICAP. Dr. Gilliotte reported the sighting and the photo to the NICAP and also inform news media of its existence. The story in the photo were used in newspapers of February 6. Asked why he had not informed the Air Force of the sighting Mr. Ditter explained that he was disgusted by their fool explanations of UFOs. He stated flatly that he knows satellites, meteors, and planets when he sees them, and he didn't want to be told it was something like that, or else marsh gas. Ditter has no doubt about what he saw and mentioned to us when we spoke to him on the phone that a schoolteacher in Roseville had seen a strange light over the Zanesville cemetery 24 hours after he photograph the object near his home. He made no link up between the two unusual occurrences. Four days after the news story appeared in the papers constable Gary Butler of Perkins Township near Sandusky reported that he had seen a UFO hovering near the NASA research center. He watched it for approximately four minutes at 3:42 AM during which time it Hubbard about 40 feet above the ground. He described it as a disc shaped bright blue roughly 20 feet in diameter. When he drew closer the object disappeared behind trees. None of the workers at the Plumbrook research center cited the UFO. From Flying Saucers UFO Reports Magazine #2 1967.